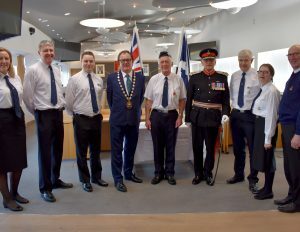 A man who has dedicated his life to The Boys’ Brigade (BB) has been presented with a British Empire Medal (BEM) at a ceremony at East Dunbartonshire Council HQ. The BEM is the latest prestigious honour bestowed on Alistair Whitelaw from Lenzie, who has received many accolades for his work with the 1st Lenzie BB Company over the last 50 years. Since 1965 Alistair has given up weekends and evenings to work with young people in the community in his numerous roles as a BB Officer and also as a Duke of Edinburgh Award instructor. He has been BB President’s and Queen’s Badge Instructor, Wayfaring and First Aid instructor and the Company’s colours holder. Alistair has also taken the BB Bible Class on many occasions and organises the annual 1st Lenzie BB Christmas card delivery for charity. HM Lord-Lieutenant of Dunbartonshire, Rear Admiral Michael Gregory OBE, presented Alistair with his BEM on behalf of Her Majesty the Queen at an Investiture in the Council headquarters in Kirkintilloch this week. Alistair has previously received recognition for his work and in 2011 he was awarded the Strathkelvin Battalion’s Long Service Award for 62 years’ service and he was presented with a long service certificate on behalf of Lord Griffiths of Bury Port, President of The Boys Brigade in 2015. In 2016 he was given a Royal Commendation for his 50 years’ service to the 1st Lenzie BB Company and Duke of Edinburgh Awards Scheme, presented by the Earl of Wessex at the Palace of Holyrood House. More recently, in 2018, he received a Lifetime Achievement Award at the Youth Link Scotland, Youth Worker of the Year Awards from John Swinney, MSP, the Deputy First Minister and Cabinet Secretary. “Thanks to his unwavering dedication, Alistair has shaped the lives of many young people in Lenzie over the last 70 years. He has gone above and beyond the call of duty as a BB Officer with 1st Lenzie Company and his commitment as a member and Elder of Lenzie Union Parish Church and as a Duke of Edinburgh Award instructor, is very admirable. The Investiture was also attended by Vice Lord-Lieutenant Jill Young, Deputy Lieutenant Mr Gerard McElroy who read the citation and other Deputy Lieutenant members of the Honours & Awards Committee. Music for the special event was provided by the East Dunbartonshire String Orchestra, featuring pupils from Bearsden Academy and Douglas Academy. You can find out more about the 1st Lenzie company by visiting its facebook page.